Morph Conformations is under development (see limitations). There are several ways to start Morph Conformations, a tool in the Structure Comparison category. It is also implemented as the command morph. The different structures should be opened as separate models or submodels in Chimera and superimposed. The apparent motion across a morph trajectory depends on how the input structures are superimposed; matched regions will remain approximately steady. The structures can have different numbers of residues or different sequences (homologs or mutants can be compared), but currently they must contain equal numbers of chains. Chains are paired by chain ID if the sets of IDs are identical, otherwise by order of occurrence in the input files. The next step is to populate the Conformations list with structures; the order in the list corresponds to the order in which they will be visited in the output trajectory. 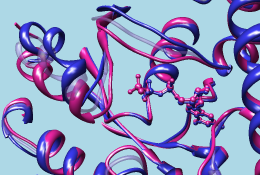 The same model can be listed more than once to produce a morph trajectory that visits the same conformation more than once, for example: A → B → C → A.
Clicking Add... brings up a dialog that lists the open molecule models. Clicking a model's name and then the Add button (or double-clicking the model's name) puts it in the Conformations list. Multiple models can be chosen and added simultaneously. A block of models can be chosen by dragging, or by clicking on the first (or last) line in the desired block and then Shift-clicking on its last (or first) line. Ctrl-click toggles the state (chosen or not) of single line. After the desired conformations have been added, the model-choosing dialog can be dismissed by clicking Close. rigid-body transformations of atom groups partitioned by hinge regions. Hinges are identified as described in Krebs and Gerstein, Nucleic Acids Res 28:1665 (2000). How interpolated coordinates are generated, and in how many steps, can be specified independently for each segment. The following four settings apply to the segment preceding the structure currently highlighted in the Conformations list. corkscrew (default) - Each group's starting and ending positions are related by a rotation about a center chosen to describe as much of the movement as possible, and a translation along the axis of rotation. These two components are interpolated. independent - Each group's starting and ending positions are related by a rotation about the group's center of mass, and a translation. These two components are interpolated. linear - Each group's starting and ending positions are related by a translation, which is interpolated. Core fraction [f] - what fraction of the residues in a chain to group in the first step of hinge detection (default 0.5). The best-matching fraction f of residues (best-fitting between the starting and ending structures) comprises one group and the remaining (1–f) a second group. Going through the residues in order, hinges are added between consecutive residues where there is a change from one group to the other, as long as a hinge is at least 6 residues away from the previous hinge (does not create a segment shorter than 6 residues). Force Cartesian intermediates (off by default) - whether within-group coordinate changes should be interpolated strictly in Cartesian space. Otherwise, internal coordinates will be used for the interpolation where possible. Using internal coordinates is slower but produces less distortion. A trajectory made with Cartesian forcing may be acceptable if few atomic details will be shown (for example, if only ribbons will be displayed). Minimization requires the correction of structural inconsistencies, addition of hydrogens, and association of atoms with force field parameters. Dock Prep, AddH, Add Charge, and Minimize Structure are called in no-GUI mode to perform these tasks; that is, the dialogs will not appear, but each tool will execute with default settings. When minimization is turned on, interpolation to generate an intermediate will use the minimized coordinates of the prior intermediate. The trajectory will be opened as a separate model. Coordinates for the atoms in common from the segment endpoints (input structures) and the intermediates comprise the frames of the trajectory. The MD Movie tool can be used to record the trajectory as a movie file. If the movie includes ribbons, consider re-evaluating secondary structure at each frame as described below. After the trajectory has been viewed, it can be saved as a PDB file. Hide hides the Morph Conformations dialog, Quit exits from the tool, and Help opens this manual page in a browser window. If the Morph Conformations dialog has been hidden or becomes obscured by other windows, it can be resurrected with the Raise option for its instance in the Tools menu. Multiple copies of the Morph Conformations dialog can coexist, possibly with different settings and/or listed conformations. Intermediates are generated by interpolating between starting and ending structures. Interpolation requires a pairing of atoms in the starting structure with atoms in the ending structure. Only atoms common to both segment endpoints are included in the morph trajectory. The structures must contain equal numbers of biopolymer chains (see limitations). If the sets of chain IDs are identical (for example, each structure contains chains A and B), the IDs will be used to indicate pairing; if they differ (for example, one structure contains chains A and B, whereas another contains chains A and D), the chains will be paired by their order of occurrence in the input files. Residues are paired by aligning the chain sequences. The sequence alignment is performed using the matchmaker defaults (Needleman-Wunsch algorithm, BLOSUM-62 matrix, secondary structure reassignment with ksdssp, 30% secondary structure scoring, etc. ), except that the Nucleic matrix is used for nucleic acids. Only the sequence alignment stage of matchmaker is performed, not the superposition of structures. Morph Conformations does not change how the input structures are superimposed. HET residues such as ligands and ions are only included if they are present in both structures and attached to the same atom(s) in the paired chains by at least one “covalent” bond (which can be an unrealistic bond added manually, e.g., with the command bond, and subsequently undisplayed) or ion coordination pseudobond. A few example systems are listed here, including chain IDs. Currently it is necessary to delete other peptide chains before morphing between the structures. As structures become less similar in sequence, a morph trajectory between them is more likely to contain backbone “breaks,” corresponding to gaps in the sequence alignment that defines the atoms in common. For more complicated examples (simultaneously morphing molecules and density maps, morphing symmetric copies of a molecule), see the ParM filament tutorial at the Chimera website. MD Movie does not automatically re-evaluate secondary structure. MD Movie does not automatically recompute secondary structure assignments as coordinates change across a trajectory. This is relevant when ribbons are displayed and the conformational changes are large enough to alter secondary structure assignments. To recompute secondary structure at each frame, use a per-frame script in MD Movie that includes the Chimera command ksdssp. Sequences should be easy to align. The sequences of the structures must be aligned to determine the atoms in common for interpolation. When the sequences are dissimilar, parts of the sequence alignment may be wrong, leading to a jumbled and unattractive morph trajectory. A possible future improvement is to allow users to specify residue pairings with an input sequence alignment. Minimization limitations. The Minimize Structure tool has its own set of limitations.